Alas, the dreaded stomach bug has rendered me far too weak to train this week, so I thought I would talk a little bit about what I spent my weekend doing - being ill and, more importantly, watching the first ever Men's Roller Derby World Cup. 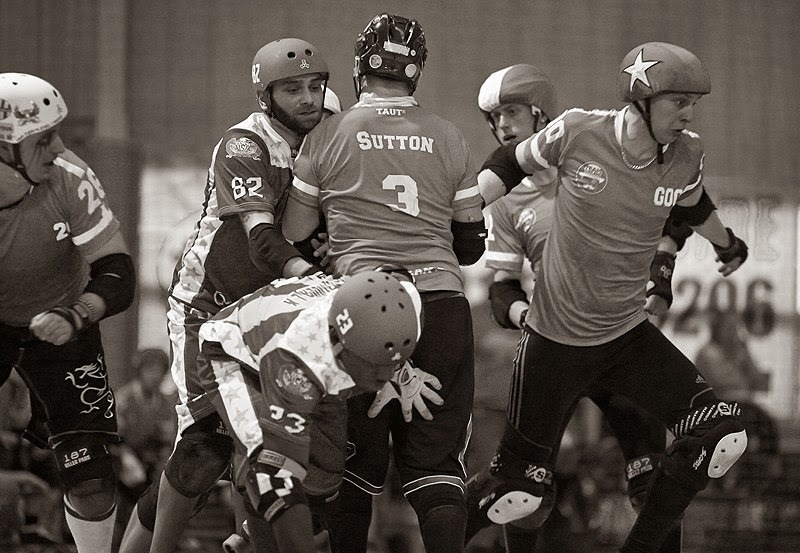 I was introduced to Men's Roller Derby ("Merby" or "Broller Derby" for short) at the beginning of this year when I went to officiate at a Team England Men's practice. I was aware it existed - the Brawds have their own brother team, the East Anglo Smacksons - but I had never watched any before. It had never really crossed my mind that I would be interested in it. I was used to Roller Derby and I didn't want to watch another off-shoot of it. The same reason why I have never watched Junior Roller Derby, although I probably should! Anyway, I digress. Even though I had never watched Merby, I was excited to see some, especially at an International standard! From then on, I was hooked, Merby had won my heart. I don't necessarily mean the rules are different, they're not. But how they play is different. The tactics are slightly different and, being heavier built, skaters tend to throw themselves in to it more. That's not saying there aren't the light, juking, quick on their feet players. A jammer in the final even took a minute to stop and assess the pack before he made a move. There is a lot more recycling in the pack, a lot more goating, and lot more trickery. It is also a lot more penalty heavy, though. Men love their apex jumps and it's pretty much guaranteed that you'll get to see one during a game. It makes me squeal with joy everytime! I'm not saying there isn't in Roller Derby, but it's more noticeable in Merby. The jammers always line up and shake hands before each jam, sometimes the whole pack acknowledges each other and gives a friendly pat on the back. I've even seen a player being goated or incessantly harassed while trying to get past a blocker but as soon as the whistle goes, they shake hands, slap each other on the back, give a big smile and leave as friends. It's really heart warming to watch. A player from Ninjapan broke the plate on his skates during the opening ceremony. 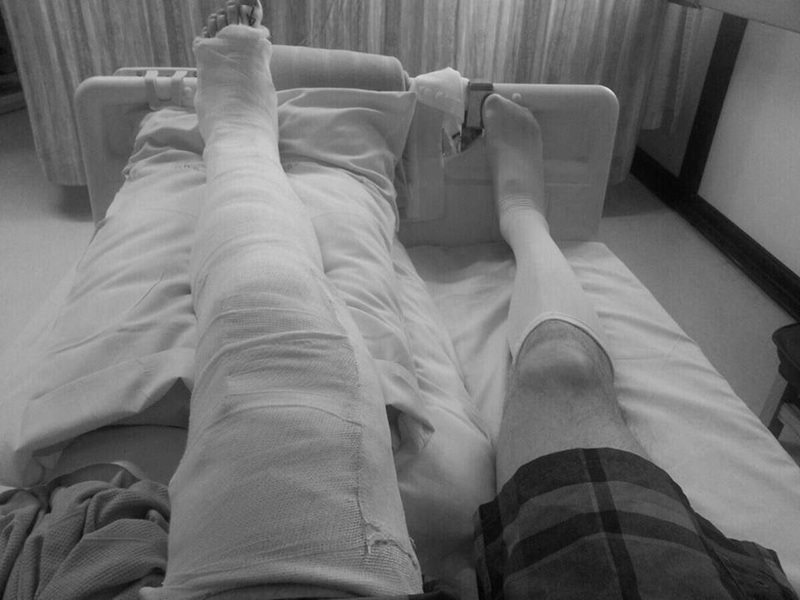 When he took them to the Quad Skate Shop stall, it turned out he had been wearing the same skates for 15 years; they were completely battered with even a hole for his toe to poke through. Instead of repairing the skates, they sponsored him with a brand new pair. Team Argentina's funds unfortunately ran out while they were at the tournament. So much so that one of the team members, El Pibe, had to sell one of his tops that he skated in that weekend, simply to buy food. Once the word spread, a red cowboy hat was passed through the crowd and over a £1000 was raised for them. 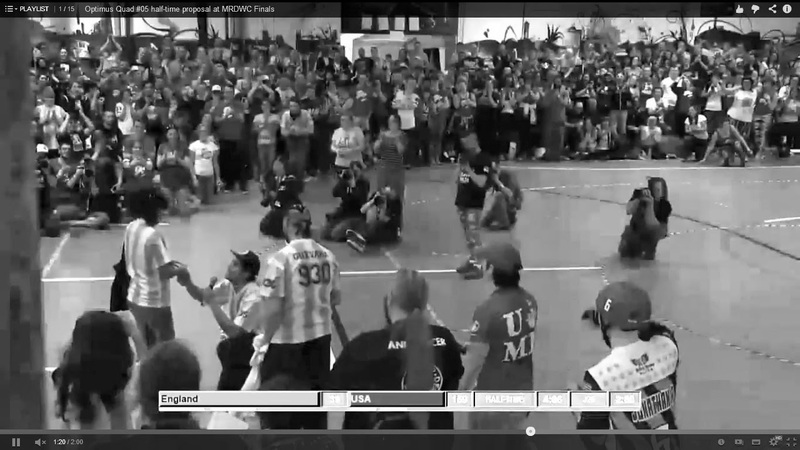 During half-time of USA vs. England final, Optimus Quad, of Team Argentina, started to make a speech about how brilliant their weekend had been and wanted to thank everyone. He then went on to thank his girlfriend who had introduced him to roller derby and continued to get down on one knee and propose to her in front of thousands of fans. She said yes! The crowd went wild! All this stuff makes me all teary eyed and me feel all warm and fuzzy inside. That is what this sport is about. Yeah, we like to put on skates and kick each others asses, but really it's about bringing people together and supporting each other. I've said it before, and I still stand by it, Derby brings the most wonderful of people together and I really don't think you can say that about any other sport.